The New Yorker article by Jonah Lehrer overstated the problem, making the profession of science look much more flawed than it really is. But does the science world have any way to address this public insult? Nah. 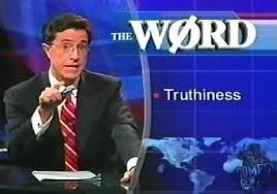 “THERE’S NOTHING TRUTHY ABOUT AN ATOMIC BOMB.” Former Scientific American editor John Horgan nailed the problem with Jonah Lehrer’s New Yorker Article about the scientific method by comparing it to Colbert’s favorite term, “truthiness.” Lehrer did a lousy job of keeping things in perspective. He used a fine scale flaw in the scientific method to create an air of large scale defectiveness. He’s wrong, even borderline irresponsible, as Horgan points out by saying basically that just because there are some small scale problems with the scientific method, it doesn’t mean we don’t have a solid understanding of the science behind something like an atomic bomb explosion. But can a blogpost that gets 12 comments compete with the New Yorker? A little over a year ago (November 17, 2009 to be specific) news emerged that roughly 1500 emails had been stolen from climate scientists in the U.K. The climate science community basically pooh-poohed the story, saying it was trivial. But the opponents of climate science immediately set to work spinning it into a huge story on FOX News, in the Wall Street Journal, and everywhere else they could, which eventually succeeded in smearing the entire climate science community. A year later it was clear the science crowd bungled their management of the issue in terms of their public image. Now a similar situation is arising with the three articles I talked about last week which together paint a picture of science as suffering from logical flaws, human errors, and racial/political bias. So far there has been no formal answer from any major science organization, and I’m guessing there won’t be, except to keep pretending the profession has no serious image problems. And that’s because there is no interest in, or even awareness of, the public perception of science as a profession. In the same way that scientists show up for public presentations with their hair messed up and food on their shirt, they are just as oblivious of how the public perceives them and/or simply don’t care, believing there is no cost in having a lousy public image. That’s pretty much the general attitude as you see this issue being as quickly dismissed on the science blogs as Climategate was. The bulk of the discussions seem to have focused on the Lehrer article in The New Yorker, perhaps because it addresses the entire profession of science and is widely read. But I think the more damaging article was the Atlantic piece, “Lies, Damned Lies, and Medical Science.” That’s the one that spun my head around at the level of noise due to the basic flaws in the profession of science. Which is so typical of a disconnected scientist. That’s called grasping the divide between the REALITY of what we know, versus the PERCEPTION of what the public might think given their limited knowledge of the topic. It requires a certain mode of thinking, of awareness, of an ability to listen (that age old problem for scientists), and a willingness to act proactively, rather than just reactively (as happened with Climategate). What should have happened with Climategate is that some science organization should have taken a lead role within a day of the email theft and begun aggressively presenting the climate science version of the story — that there was nothing dishonest in the emails. The only thing dishonest was the act of theft committed by the climate skeptics who had fallen to such a level of desperation they were willing to do anything to score points with the public. But in the absence of such a singlular, loud, powerful voice, the skeptics had their way, scoring such a complete victory that, as I pointed out a couple months ago, nearly a year later Bill Maher, an avid climate science supporter, had managed to inadvertently adopt their lies. Now the same circumstance exists for these articles. I’m a big fan of John Horgan. He wrote an excellent book in the mid-90’s titled, “The End of Science.” It posed a very, very good question — which is, “Are there limits of exploration to some fields of science?” The answer to that question — which flies in the face of every brainless rah-rah promoter of science education — is a solid YES. I know this well. I was a marine biologist. The discoveries in the oceans today are NOT as huge and broadly exciting as they once were. Jacques Cousteau led expeditions that discovered unexplored habitats and found stocks of wildlife nobody knew about. Today, thanks to Google Earth and other efforts, EVERY square millimeter of the planet’s surface has been photographed. Not all the bottom of the ocean has been explored, but the likelihood of anything remotely close to discovering the hydrothermal vents of the mid-1970’s is infinitely small. There is little left to discover. That’s what happens. There ARE limits. But most science people didn’t want to hear what Horgan laid out in his book, so you’ll find lots of rotten reviews of it on Amazon. All I can say to those people is sorry, the truth hurts. And by the way, you might want to keep in mind that the truth is the whole object of science. So now John Horgan posted this very good analysis of the Lehrer New Yorker article, and he lays out the PUBLIC RELATIONS flaw of Lehrer’s piece — that by focusing on a very real small scale problem in the scientific method, he leaves the door wide open for the enemies of science to blow it up to sound like the same problem exists for the larger scales of science. It doesn’t. So once again, yes, we know the REALITY of the situation is that there’s no serious major problems with the profession of science. But if unattended, these three articles have the potential to allow the public PERCEPTION to plummet into the toilet. The risk of this is very significant, especially given the number of anti-science forces out there these days. It is perfect ammunition for them, they know how to spin it, and if nobody takes any proactive action, the mud will be forcefully slung, once again. Science and public relations — it’s like oil and water.